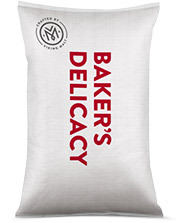 Delicacy Wheat 40 is produced by mildly roasting high quality wheat. The flavor of roasted wheat is nutty, slightly bready and sweet. Roasted wheat can be used to provide roasted wheat flavor and body for bakery and other food products, such as sauces. Gives products slightly crude "grain" aftertaste.